Thus will end the central banks' bombastic hubris and the public's faith in central banks' godlike powers. 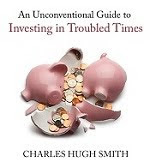 Having fixed the liquidity crisis of 2008-09 and kept a perversely unequal "recovery" staggering forward for a decade, central banks now believe there is no crisis they can't defeat: Liquidity crisis? Flood the global financial system with liquidity. Interest rates above zero? Create trillions out of thin air and use the "free money" to buy bonds. Mortgage and housing markets shaky? Create another trillion and use it buy up mortgages. And so on. Every economic-financial crisis can be fixed by creating trillions of out thin air, except the one we're entering--the exhaustion of credit. Central banks, like generals, always prepare to fight the last war and believe their preparation insures their victory. China's central bank created over $1 trillion in January alone to flood China's faltering credit system with new credit-currency. 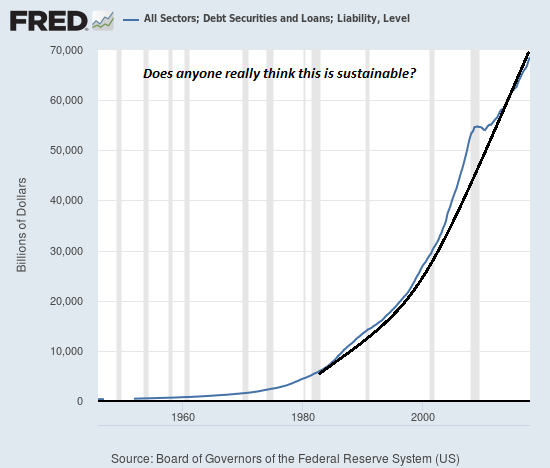 Pouring new trillions into the financial system has always restarted the credit system, triggering renewed borrowing and lending that then powered yet another cycle of heedless consumption and mal-investment--oops, I meant development. The elixir of new central bank money isn't working as intended, and this failure is now eroding trust in the central bank's fixes. Central banks can issue new credit to the private sector and it can can buy bonds, empty flats and mortgages, but no central bank can force over-indebted borrowers to borrow more or force wary lenders to lend to uncreditworthy borrowers. Let's be honest: the entire global "recovery" since 2009 has been fueled by soaring debt. The output of more debt is declining, that is, every additional dollar of debt is no longer generating much in the way of positive returns. As with any stimulant, increasing the stimulant leads to diminishing returns. Then there's the issue of debt saturation and debt exhaustion: those who are creditworthy no longer want to borrow more and those who are not creditworthy cannot borrow more, unless lenders want to eat the losses of default a few months after they issue the new loan. The evidence is plain enough: defaults of student loans and auto loans are already at monumental levels, and the recession hasn't even started. Zero-percent financing for vehicles is a thing of the past, and those borrowers with average credit ratings are paying 6% or more for a new vehicle loan. Coupled with the ever-higher prices of vehicles, this is leading to auto loans of $600 and $700 a month and lenders extending the duration of the loans from 5 to 7 years. Just how badly do households need a new vehicle at these rates and prices? As for housing--unless the buyer just sold a house in a bubblicious market and has hundreds of thousands of dollars in cash, housing is out of reach of the bottom 95% in many markets. This raises the other dynamic of credit exhaustion: the whole exercise of buying a home or dumping more money in stocks is ultimately based on greater fools arising who will pay substantially more that the buyer paid today. Greater fools generally depend on credit to finance their purchase, and so the erosion of creditworthy borrowers means the pool of greater fools willing and able to pay $1.2 million for the old bungalow someone paid $1 million for today is drying up fast. Only a fool buys an asset that is poised to lose value as the pool of future buyers dries up. No wonder insiders are selling stocks like no tomorrow, and housing markets have become decidedly sluggish: the pool of qualified borrowers who are willing to bet on another decade of central-bank goosed "growth at any cost" is shrinking rapidly. The next crisis won't be one of liquidity that central banks can fix by emitting additional trillions; it's a crisis that's impervious to central bank manipulation.The credibility of central banks is already evaporating like spilled water in July-baked Death Valley. Central banks cannot magically make uncreditworthy borrowers creditworthy or magically force those who have forsworn adding more debt to borrow more at high rates of interest, and as a result they are powerless to stop the tide of credit from ebbing. Thus will end the central banks' bombastic hubris and the public's faith in central banks' godlike powers, the "global growth" story, the China story, and all the other fairy tales that have passed as policies for the past decade rather than what they really were: politically expedient cover for the greatest expansion of inequality in modern history. Thank you, Tom B. ($200), for your beyond-outrageously generous contribution to this site -- I am greatly honored by your steadfast support and readership. Thank you, John D. ($50), for your magnificently generous contribution to this site -- I am greatly honored by your steadfast support and readership.